Radwan Altaweel and his 24 year old son, Basel Altaweel, work at Shop.Altaweel Copper and Brass Designs. Basel’s 30 year old brother is currently in the military, serving with the Syrian Arab Army. The family name means “tall”, and they are both standing tall against the Western designs to destroy their homeland. 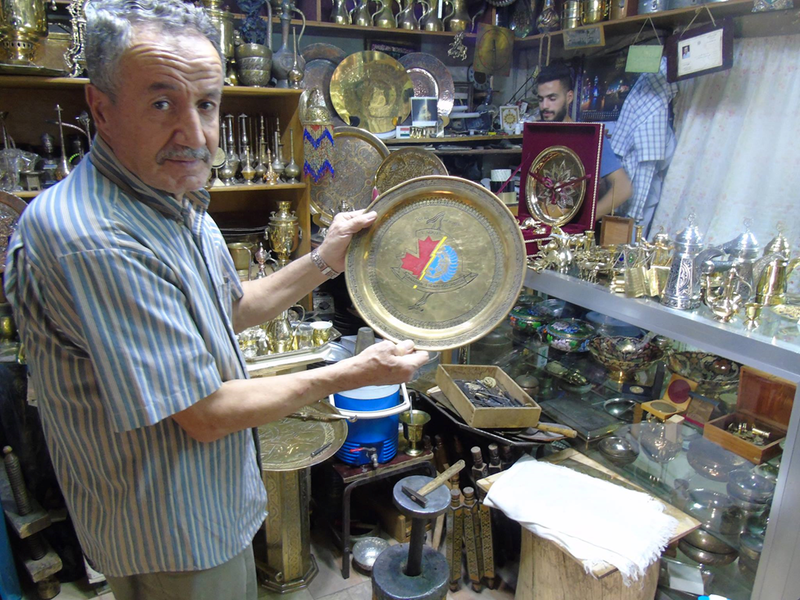 Radwan says that he used to ship his delicately crafted, intricately designed, jewelry, mugs, plates, and assorted pieces of copper and brass, overseas, but that business has been bad since the war started. Radwan’s 30 year old son, Basel’s brother, has been fighting in the Syrian Arab Army for about 5 years, and he comes home every month for about a week, while Basel, currently in school, is studying for his Master’s in Interior design. “I am happy here,” he says, before adding, “war doesn’t bother me.” This happiness and defiance, in the face of Western sanctions, Western terrorists, and Western bombs, no doubt frustrates the Western warmongers, who are dedicated to the death and destruction of this ancient and civilized land. The father offered that, “From war we make peace (from art)” as he proudly showed me a plate that he designed, featuring a Maple Leaf welded to the United Nation’s logo. He was friends with Canadian soldiers when they were Peace Keepers at the Golan Heights. 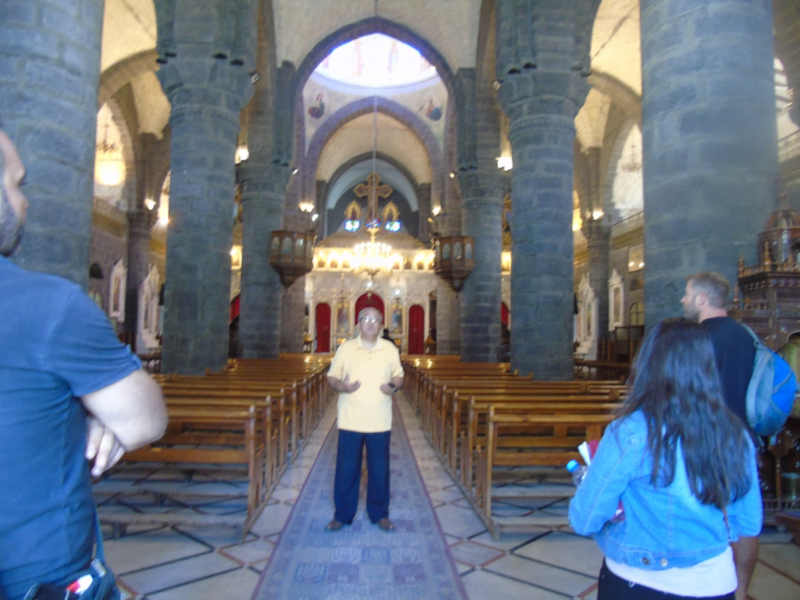 Chassan Chahine , of the St. George’s Orthodox church in the Old City of Damascus, made a point of showing us some intricate wood inlaying artwork of the Intarsia style. Instead of using paint, the intarsia style makes use of different types and colors of wood. Metaphorically, this style represents the pluralism of Syrian society where different peoples and religions are one and united. They are Syrians first and foremost. Religion is a personal matter. Chahine didn’t mince words when he said that “They (Jews) are in our book,” but that “We are not in their book.” Syrians accept Jews, but Zionists reject Syria, and all Syrians. The Western terrorists are violating Syrians and the civilization that they represent each and every time they bomb innocent people. If the West, including Canada, had any moral fortitude, it would oppose this terrorism rather than support it. Bombs recently thundered not far from where I am writing this. I’ll find out soon if anyone was killed, but I just found out what it is like to be a Syrian, not knowing when or where the bombs might fall. This country is being violated by terrorists who destroy history, and people. Those who think differently or practice a different religion, or refuse to switch religions, or happen to be in proximity of a mortar bomb, are deemed unimportant. Recently, protestors were protesting peacefully in a terrorist-occupied area, and the terrorists murdered them. These are the “rebels”, the “freedom fighters”, the “moderates” that the West supports.